"The Lazarus Project Part 1: Predators and Prey!" 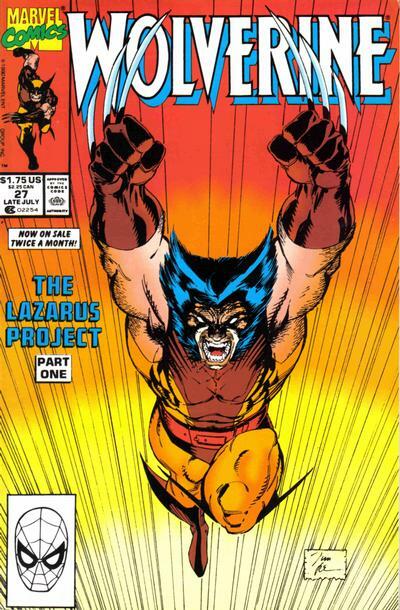 Wolverine is drawn into the Lazarus Project. 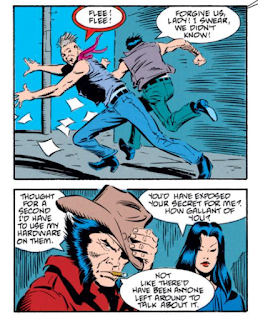 In Lowtown, Wolverine and Tyger Tiger fight a group of street toughs, aided by Karma, then retire to the Princess Bar, where Wolverine learns that Prince Baran has hired Jessica Drew as his bodyguard. Meanwhile, on the island of Rumika, a group of villagers are given custody of the Master Form. Meanwhile, Andover discusses the Master Form, key to the Lazarus Project, with his business partners, General Coy and Prince Baran, as Jessica patrols the palace. She overhears a scientist named Page discussing an attack on Rumika, and Page orders a massive robot named Pinocchio to attack Jessica. 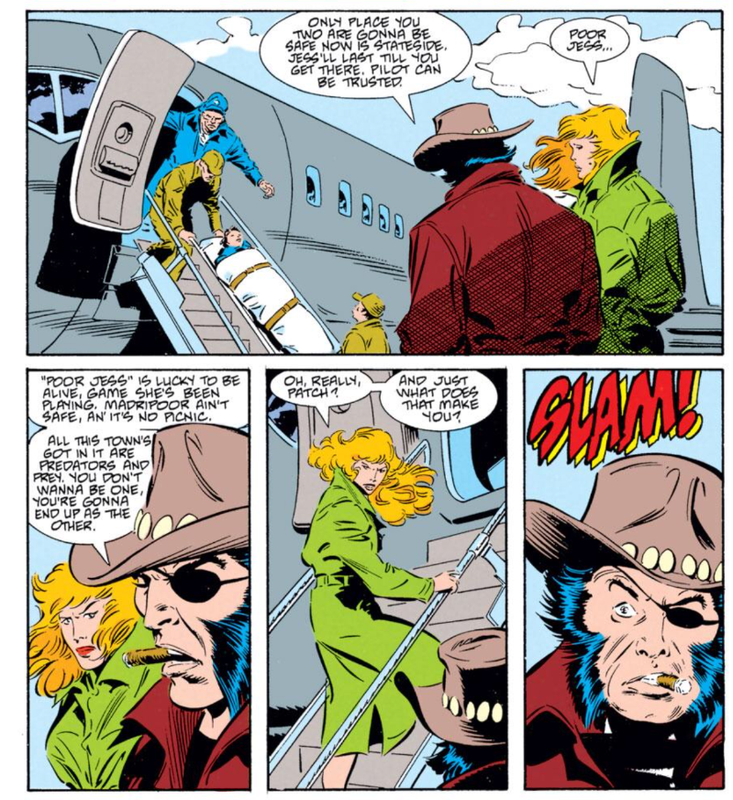 Later, Wolverine finds a badly beaten Jessica in the streets, and sends both her and Lindsay McCabe back to America for their own safety. Investigating the palace himself, Wolverine discovers Page and is attacked by Pinocchio, who proves resistant to his claws. 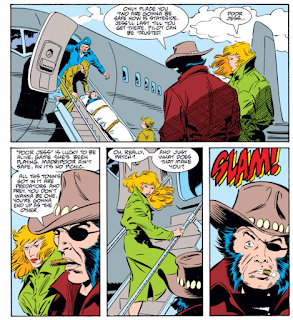 When Page tosses a beaker of chemicals in Wolverine's face, he dives in pain out of the palace, eventually staggering off the docks and into the ocean. Though he'll returns for the Bloody Choices annual, this is John Buscema's last contribution to the regular series he helped launch. Similarly, Jessica Drew and Lindsay McCabe exit the series with this issue. While the former, after taking a few years off, will pop up elsewhere in the Marvel Universe (including a stint as a fairly significant member of the Avengers under Brian Michael Bendis), this is pretty much the last hurrah for Lindsay McCabe, who makes one more appearance after this issue (along with Jessica), in the backup story of a Spider-Man annual in the mid 90s. This issue introduces a handful of characters that will feature in the subsequent story: Andover and Dr. Page, who work for the Lazarus Project, and Pinocchio, a robotic agent of Dr. Page's. Another Jim Lee cover to this issue, a particularly iconic one, thanks to the central image being used by Marvel in a lot of their licensing material moving forward. 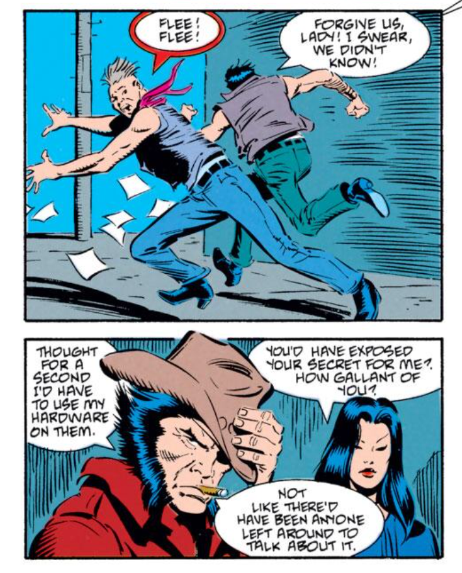 Wolverine is still using the Patch identity in Madripoor, and it's suggested that the general populace is still unaware of true identity. Readers are reminded in this issue that Karma is only working for her uncle in exchange for his help locating her missing twin siblings. As with the previous summer's "Gehenna Stone Affair", the series marks the transition into twice-monthly shipping with the launch of another multi-part storyline, the four part "Lazarus Project". In execution, however, this reads very much like an early Claremont-penned issue of the series (which isn't a bad thing), helped of course by John Buscema's last contribution to the title he helped launch. As much as this issue kicks off the new storyline, it's really more concerned with getting readers up to speed with the status quo of the supporting cast, which have been mostly pushed aside in the wake of the Goodwin/Byrne run and subsequent fill-ins. So we get refreshers on the Tyger Tiger/General Coy detente, the return of Karma (and a reminder of her whole reason for being in the book), and a sendoff for Jessica Drew and Lindsay McCabe. It remains to be seen how the story will unfold, especially with an artistic change looming, but for now, this reads like business as usual, which is a refreshing change of pace for the series. 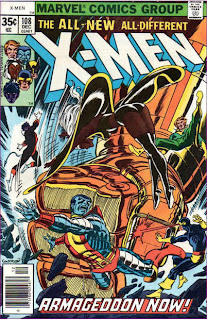 Next week: Uncanny X-Men #265, New Mutants #92, and X-Factor #57. … unlike this. With no imminent Spider-Woman project evident on the horizon, I suppose Duffy and/or Harras just wanted her out of Wolverine. 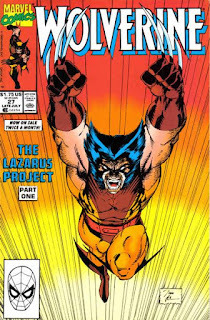 Given both the general simmering danger of Madripoor and the periodic flare-ups that keep the series in business, though, Logan’s decision comes across as rather arbitrary. The move just seems way more driven by authorial or editorial fiat than plot- or character-based; I think simply having the gals decide it was time to go home to the States would’ve felt more organic. Man, I completely forgot that this first part was by Buscema, and thus everybody is so "on model" (the model established for this particular series, that is). Also forgot that it makes a point of writing Jess and Lindsey out of Madripoor. I guess because the remaining issues became so nonsensical, I long ago filed all four issues away as filler. @Anonymous: The Lazarus Project was supposed to cross over with the second Fallen Angels series, which was to feature the Broker as the major villain, and reveal what happened to Leong and Nga. Huh. Well, that's a shame (on multiple levels). I assume that by the time Duffy sat down to write this story she knew Fallen Angels II wasn't happening. I wonder why she decided to stick with it, then? @Blam: With no imminent Spider-Woman project evident on the horizon, I suppose Duffy and/or Harras just wanted her out of Wolverine. Or maybe incoming writer Hama? Knowing he wasn't planning on using them, he asked Harras to ask Duffy to write them out? I dunno. The move just seems way more driven by authorial or editorial fiat than plot- or character-based; I think simply having the gals decide it was time to go home to the States would’ve felt more organic. Definitely. It's not like Jessica working for the Prince was such an integral element of the book that to have her quit the job and go home with little explanation would be any worse than this. @Jason: I guess because the remaining issues became so nonsensical, I long ago filed all four issues away as filler. Knowing the reputation of this story as being nonsenscial fill-in dreck, I too was surprised at how "regular" this issue felt. The Madripoor setting, the supporting cast, the Buscema art. Too bad it doesn't last.